Are you washing your hair right? Use cold water to rinse off shampoo. Hot showers are relaxing, but did you know that warm water can damage your hair by stripping it of its oils? To avoid this, switch to lukewarm water when you're shampooing, then switch to cold water once you're ready to rinse it off. The ideal way to use a conditioner is to apply the product from the middle of your hair to the ends—avoiding your roots completely—so as not to produce excess oil on your scalp. Compared with dry hair, wet hair is more prone to breakage. With that in mind, make it a point to do the following after shower: Use a wide-tooth comb to untangle knotted ends, avoid using heating tools, and let your hair dry on its own. Target your scalp and nape. When washing your hair, focus on the scalp and nape—two spots where dirt and oil tend to accumulate. A hardworking cleansing combo like Head & Shoulders Supreme Moisture and Smooth Shampoo and Conditioner should be able to clean your scalp, nix dandruff, and keep your locks strong and shiny. Head & Shoulders Supreme Moisture and Smooth contains argan crème, which is high in vitamins A, C, E, and antioxidants. In addition, the haircare line comes with zinc pyrithione (ZPT), which takes care of itching and keeps scalp healthy. This promotes the growth of healthy strands, so you get to be dandruff-free without worrying about drying your hair. Use an ample amount of product. When it comes to hair care, less is more. A coin-sized amount should be enough to remove dirt and oil on your scalp and nape. Try shampooing your hair twice during bath time—the first rinse to clean your scalp, and the second rinse to moisturize your roots. Remember: Stick to small amounts, and don't overdo it! 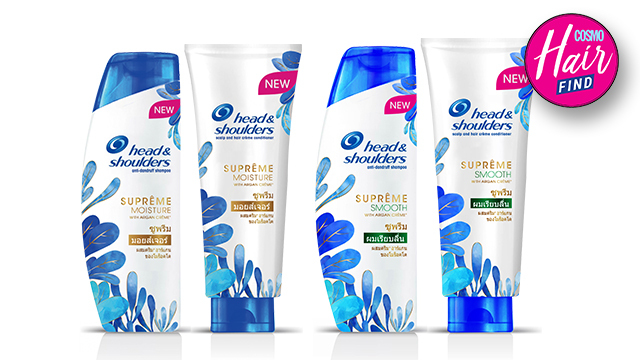 To know more about these products, follow Head & Shoulders on Facebook.